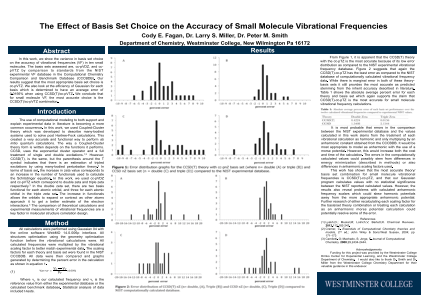 Abstract: In this work, we show the variance in basis set choice on the accuracy of vibrational frequencies (VF) in ten small molecules. The basis sets assessed are, cc-pVDZ, and cc- pVTZ by comparison to standards from the NIST experimental VF database in the Computational Chemistry Comparison and Benchmark Database (CCCBDB). Our results suggest that the most appropriate basis set choice is cc-pVTZ. We also look at the efficiency of Gaussian for each basis which is determined to have an average error of 0.0156% when using CCSD(T)/cc-pVTZ. We conclude that for small molecule VF, the most accurate choice is the CCSD(T)/cc-pVTZ combination.Summary: We showed how the variance on basis set choice impacts the accuracy of vibrational frequencies of several small molecules. References: (1) Lyakh,D. ; Musial,M; Lotrich,V; Bartett,R. Chemical Reviews.